The tech web site pocketnow.com has published the first picture of the rumored HTC One X smartphone that is expected to debut at the MWC in Barcelona, Spain later this month. According to some unofficial information the HTC One X will be the first company smartphone that comes with a quad-core NVIDIA Tegra 3 processor. 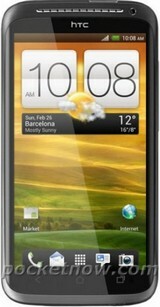 The HTC One X will also come with a 4.7-inch display with 720p resolution, 1 GB of RAM and 32 GB of on-board storage memory. Users will also enjoy an 8-megapixel camera, Bluetooth 4.0 and Beats Audio. As to the software – the One X will run under Android 4.0 and will use the HTC Sense 4.0 user interface. Earlier the HTC One X was known as HTC Edge but the leaked pictures show a smartphone that is different from the Edge as seen before. The mystery will surely be solved at the Mobile World Congress that will take place in just a few days.